From Captain George Vancouver to Muriel "Curve of Time" Blanchet to Jim "Spilsbury's Coast" Spilsbury, visitors to Desolation Sound have left behind a trail of books endowing the area with a romantic aura that helps to make it British Columbia's most popular marine park. In this hilarious and captivating book, CBC personality Grant Lawrence adds a whole new chapter to the saga of this storied piece of BC coastline. Young Grant's father bought a piece of land next to the park in the 1970s, just in time to encounter the gun-toting cougar lady, left-over hippies, outlaw bikers and an assortment of other characters. In those years Desolation Sound was a place where going to the neighbours' potluck meant being met with hugs from portly naked hippies and where Russell the Hermit's school of life (boating, fishing, and rock 'n' roll) was Grant's personal Enlightenment--an influence that would take him away from the coast to a life of music and journalism and eventually back again. With rock band buddies and a few cases of beer in tow, an older, cooler Grant returns to regale us with tales of "going bush," the tempting dilemma of finding an unguarded grow-op, and his awkward struggle to convince a couple of visiting kayakers that he's a legit CBC radio host while sporting a wild beard and body wounds and gesticulating with a machete. 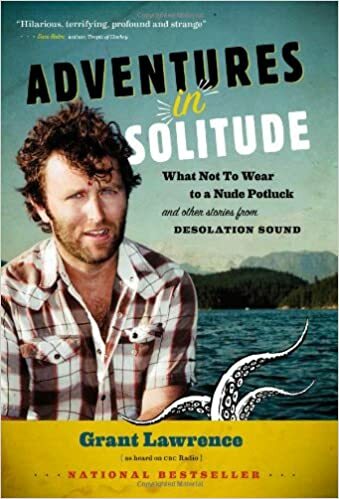 With plenty of laugh-out-loud humour and inspired reverence, Adventures in Solitude delights us with the unique history of a place and the growth of a young man amidst the magic of Desolation Sound.